Books are magical tools which can be used to comfort and calm before a rest, educate and teach during a topic time or inspire and fire the imagination ready for creative activities. Therefore, no nursery is complete without a good range of books from soft cloth, board or wipe-clean books for the very young, to early readers for pre-schoolers. 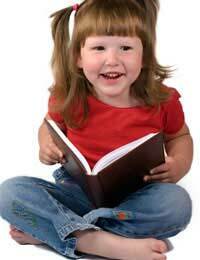 Children positively love to have stories read to them, to look at the pictures and when a little older, start to learn to read for themselves. The first stories told to children can stay with them for ever and become much loved favourites, even when they are adults themselves reading to their own children. Small children are often fascinated by small things and different worlds and will pour over pictures for some time. What better way, then, to get them really looking at a book, then by making it into a game. Whether teaching kids the shape of letters or how to find information from an illustration, the following books will lead to hours of quiet concentration! Above all, a child’s early response to and relationship with, books should be a special time. Allow them time to choose books, have time to explore them, handle them and talk about them with you and watch them soak it up!